Imines are the nitrogen analogues of aldehydes and ketones, containing a C=N bond instead of a C=O bond. They are formed through the dehydration reaction of an aldehyde or ketone with an amine. Imines derived from aldehydes are sometimes called aldimines, imines derived from ketones are sometimes called ketimines. Enamines are the nitrogen analogues of enols. In this post we go into the synthesis of imines and enamines and the mechanism of imine formation. I’m in love with the organic chemistry of nitrogen – alkaloids, in particular. To my mind, imines are just about one of the most beautiful functional groups there are. I’d love to give you the full scoop on all the amazing things imines can do, but today we’re going to keep it really simple: we’re going to talk about the mechanisms involved in their formation. That’s an imine on the left. To its right are its chemical cousins: oximes and hydrazones. What they all have in common is a C=N double bond, and they are all formed by the same process. Let’s talk about how that C=N is made. The reaction starts by stirring an aldehyde or ketone in solution with a little bit of acid. [note 1] You might recall that acid makes carbonyl carbons more electrophilic – it binds to the carbonyl oxygen and weakens the C=O bond. Now comes the exciting part. Upon addition of an amine, the carbonyl carbon (an electrophile) is attacked by the amine nitrogen (a nucleophile) and there is a 1,2-addition. The next step is a proton transfer. This serves two purposes. First of all, the OH is protonated to give OH2(+), which is a tremendously better leaving group. Secondly, proton transfer frees up the lone pair on the amine nitrogen. Finding itself free again, the amine lone pair now descends upon the neighboring carbon like a horned owl swooping down on a moonlit field mouse, expelling the OH2(+) as a neutral water molecule. The final step is a simple deprotonation of the resulting positively charged imine (iminium, we call it – most positively charged organic molecules end with -ium), resulting in our neutral product, the imine. In practice, this reaction is usually run with a dessicant like magnesium sulfate to soak up the water that is formed along the way. That’s Le Chatelier’s principle at work again: you’ll notice that the reaction is an equilibrium. If you take your imine and then dissolve it water, you can get back the original aldehyde/ketone plus the amine. So breaking down the mechanistic sequence, we get: protonation/1,2-addition/proton transfer/1,2-elimination / deprotonation. If you look at it hard enough, it might seem familiar: that’s the exact 5-step sequence for the formation of an ester from a cartboxylic acid, the hydrolysis of an ester, and the hydrolysis of an amide. that we talked about last time. Behold: underneath those four seemingly different reactions you will find unity in their mechanism. By the way, the reactions that form oximes and hydrazones proceed exactly the same way. The main difference is that hydroxylamine and hydrazines are more nucleophilic than amines (not on the exam: the alpha effect) and the products are more stable. In your teaching labs, you may have had to characterize an aldehyde or ketone by forming a hydrazone and taking the melting point. In particular, the hydrazones formed by 2,4-dinitrophenylhydrazine (DNPH) are a brilliant funky red color and are often highly crystalline, which provides another method for analysis. Now up to this point you might have noticed that the imine we were dealing with was a primary amine: connected to only one carbon. What happens when we are dealing with a secondary amine? Well, they form the C=N bond too, but there’s a key difference: you can’t deprotonate them at the end, since they have two N-C bonds (this is also called an iminium, by the way) Somehow you have to make this compound neutral. What do you do? Here’s how you do it: deprotonate the alpha carbon. The resulting chemical species is called an enamine. Enamines behave a lot like their chemical cousins, enols: they are nucleophilic at the alpha carbon and react with electrophiles. The key difference is that they are actually a lot more reactive. This makes then very useful chemical intermediates. Here’s an example of an enamine in action, a process first demonstrated in detail by Professor Gilbert Stork of Columbia back in 1963. Sometimes these are called Stork enamine reactions. Note here that at the end of the reaction there is another deprotonation to give you back the neutral enamine. If you need to get your ketone back, they will react with aqueous acid: you go to the iminium, which then hydrolyzes through the reverse of the mechanism that I drew for imine hydrolysis. Further reading: check out some of the amazing advances that have been discovered in the catalytic chemistry of enamines over the past 10 years or so. [note 1] – the acid is not an absolute requirement for this reaction, particularly with imine formation from aldehydes. However, acid does accelerate the reaction, provided that the pH is not so low that the amine is protonated. please give one simple method for the synthesis of imine and how can we remove the water formed in the reaction? 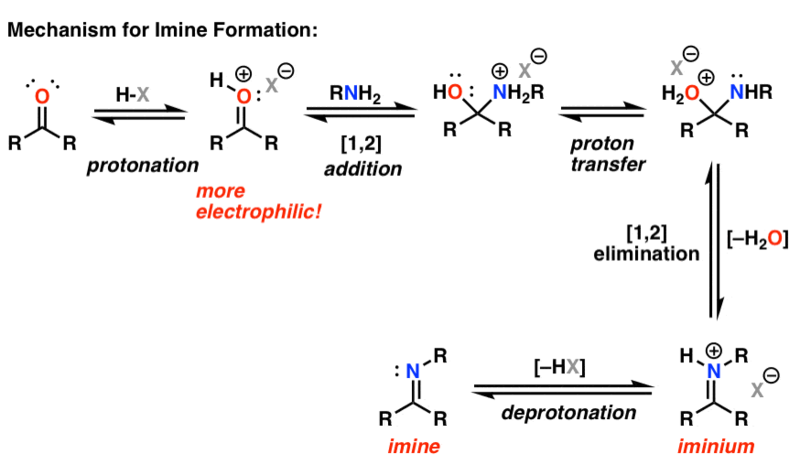 how to remove water in the imine formation reactions? there are different methods which does not involve water fromation like dehydro halogentaion, azawittig reaction. it depends on the type of imine you are working on. True. This post is written for people taking organic chemistry for the first time, who probably don’t come across the aza-Wittig reaction and other alternative methods of making imines. I have a question. How to separate aromatic imine from the reaction mixture? Thanks! Depends on your reaction mixture. Some aromatic imines are quite crystalline. The problem is that they are readily hydrolyzed. I would suggest going to chemicalforums and giving out your specific reaction conditions – there’s a lot of helpful people there (myself included) who can assist with this type of practical question. Hey James, I have a question about the reaction of imines. I can’t seem to find anything online about them except for their formation! Do you know what the outcome is when you react an imine with an acyl chloride? I can’t work out if the nitrogen attacks the C=O carbon or the oxygen attacks the C=N carbon. That’s a great help. Thank you! Looking for the distinguishing factor of a enamine, three bonds and a lone pair? but more important: this rules. your enthusiasm rules. I love chemistry too. I like this website! I’m studing a sintesis of the Penicilin V and found a obstacle, but this page help me more than a book. thanks! What would be the resulting product with H2S gas reacting with imines? When tried to to bubble H2S gas on organic imines it resulted to a solid formation. What is the component of this solid? Why it does formed? In your note you state that the acid is not an absolute requirement for the reaction.. It means that the reaction can still occur? even in standard temperature? Yes, especially with aldehydes, acid is not an absolute requirement. Hi! I am doing reductive amination in which imine is a intermediate. I am using aliphatic aldehyde and aliphatic amine in presence of Ra-Ni. CAn you suggest me what is the suitable water scavenging agent for the reaction? I don’t believe scavenging water is necessary since once the imine is reduced, it will be stable and will not reverse in the presence of water. Thank you for a very useful website which I refer to regularly. Please could I ask whether the less hindered substituted alkene would be formed in the last part of your diagram for Alkylation of Enamines (Stork Enamine Reaction) because of allylic strain? Yes – exactly! Allylic strain between the alkene substituent and the nitrogen substituent. wouldn’t acid first protonate amino group and not ketone/aldehyde? Amino group is weak base thus it should accept proton easier than C=O? Yet in this reaction oxygen is the one accepting proton. Why is that? Yes, it protonates the amine but not irreversibly. Remember if the amine was protonated irreversibly there would be no nucleophile to attack the carbonyl carbon. That’s why pH is essential. If it’s too acidic, the amine is protonated irreversibly, if it’s not acidic enough (pH 7 or higher) then the reaction is slow. The “sweet spot” is about pH 4 or 5. Thank you for your informative website! My question is with regards to imines formed in the absence of an acid catalyst. I’m assuming that the protons that eventually leave with the oxygen as water by product come from the amine group. If so, it is correct to draw the formation of the intermediate formed with an arrow showing the N-H bond disconnecting and the movement of the H to the oxygen to form OH? I’m trying to draw up the mechanism but I’m not sure if I’ve done it right. Thanks! What you’re describing is a process called “proton transfer” where the protons on nitrogen ultimately are removed and protons are added to oxygen. The exact mechanism instructors use can differ considerably. In the short way, which you describe, an arrow is drawn that shows the oxygen deprotonating the nitrogen directly. A more painfully long way to draw it (but ultimately more correct) is to invoke some kind of exterior base (like water) to deprotonate the nitrogen, and then (in a second step) to act as an acid, protonating the oxygen. It all ends up being the same thing. Ah! This makes so much sense! Might I suggest the Learn 6 reactions for the price of one article be linked? Hi! I was wondering if imine formation can happen without an acid catalyst? Thanks. Not required, but it helps. I am trying to react an aldehyde with ammonium chloride. At a low pH, the majority of the species are ammonium and not ammonia. However, at a higher pH the reaction will proceed slowly, as you mentioned. Do you have a recommendation of the optimum pH required for the imine formation? Best pH is around 4 or 5 . Question about an example that lead me to this page involving reaction of keytone with primary amine forming an imine intermediate. You said sodium cyano BH3 was mild enough the reduction could be carried out in the same vessel in one step. I can see how that will work, but what kind of yield is achieveable? Removing the imine product should shift eq. to favor more product formation which is great, but what happens as the reduced second product concentration begins to rise? Would you not risk the desired final product only being a secondary amine bumping into the keytone (I assume the keytone is solvent and primary amine con. used to control rate and yield) and reacting again to lead to an unwanted enamine side product? Would steric hinderance have any affect on preventing this? Unless thats not an issue, seems to me a better yield could be achieved with little to no side products by isolating the imine and reducing in a second step. Or maybe using the primary amine as solvent and lower con. of keytone so theoretically “all” keytone would be used, then product could be separated from solvent and maybe more keytone then added for further production? Also, the thermodynamics…this should occur at a decent rate im guessing at 20-30C with some time and gentle mixing? Heat could increase rate, but may also destabolize reducing agent to the point of attacking the keytone? And last, since imine removal drives first reaction toward making more imines, at what point would water build up become a problem? Would it still need removed? Too much h2o possibly start altering initial pH or cause rxn to slow or stop due to solvent interactions through hydrogen bonding on the small primary amine? They hydrolyze relatively easily in the presence of water. What will be the product if there is an alkyl group attached to the cyclohexanone at the alpha position which is then made to react with the secondary amine? Correction: imines formed from ketones are referred to as ketimines. Ketamine is a drug with ketone and amine functional groups. Thanks for catching that typo, Matt. Thank you for your very informative website, I often consult it when I am in doubt about organic reactions. This reaction mechanism has puzzled me over the last few days. The pKa for deprotonating a ketone is around -7, whereas many protonated amines of interest are around 10. If we only reason in terms of protonated ketone and amine and unprotonated ones, then we see directly that in the pH range 3 to 7 the product [protonated ketone][unprotonated base] should remain rather constant, and be extremely low. After doing some digging, I find that some authors prefer writing a concerted mechanism, and some attack an unprotonated ketone. The latter is certainly less electrophilic. However, at pH 5, it is 10^12 times more abundant, which in free energy terms means RT ln (10) =69 kJ/mol=16.5 kcal/mol extra in favor of this pathway. If we opt for the latter mechanism, we should expect the rate to depend on pH, but for a different reason: at low pH, there is not enough amine to attack ketone (protonated or not). At high pH, the elimination of water becomes rate-limiting (since the H2O+ moiety will spend more time as an OH moiety). Of course, my thinking is based on pKa values in water, maybe the mechanism is quite different in organic solvents. What are your thoughts on this? I think EB is correct in saying that the first step should be addition of the amine to the carbonyl, and that the proton source assists with departure of the resulting OH. I’m going to put fixing this in my correction queue.